Temperance says it is time for you to apply what you have learned – see what you have mastered – you are an artist in all phases of your life. Try new things now, while at the same time – maintaining a solid hold on your present security. Allow yourself to experience “profound” meditation – use your “inner” resources – for they are your invitation to the possibilities of spiritual knowledge and realization. Your Higher Self will always warn, inform and help you appreciate an experience – while never suppressing temptation itself – for without temptation, there can be no spiritual progress. That is why it is so important for you to maintain balance right now. Trust that your patience will build your dreams. Focus all your energy on maintaining harmony between the material and the spiritual. Take it easy and don’t rush things – do not give up your security – you need more time before making any major decisions. You are experiencing your ability to heal yourself by correcting the imbalances and reconciling the difficulties in the environment through compassion. Truth will be realized from within as you unite your human endeavor with the gift of Gods grace. Your lessons are learned through your experiences. Balance is essential now – use diplomacy, tact and temper your emotions when your strength is being tested. As you give birth to new beliefs from the death of old ones – you experience new freedoms which require re-adjustments in your behavior. With freedom comes the responsibility for your actions and the birth of “natural guilt” – the creative mechanism for solving problems and preventing violence. You learn to resolve your dilemmas and assimilate your beliefs by seeing mistakes as information and problems as challenges. A balance of rights is achieved through your compassionate identification with others and the communication of your emotions and aggressive feelings. Vision and inspiration are the means of arriving at intuition. Authentic inspiration always entails an “inner” upheaval which pierces the soul like an arrow – wounding it and making it experience “profound” emotion which is the synthesis of joy and sorrow. Inspiration is the knowledge of how to be active and passive at the same time. Active – in what concerns your “question” and passive – in what concerns the “answer”. Humility alone – honoring the vows of poverty, obedience and love renders you open to “inspiration”. Say to yourself that you know nothing – but are capable of knowing everything and in this position of humility – immerse yourself in the pure, strengthening element of “thinking together” or inspiration. Free yourself from this artificial personality – your behavior and reactions have become a string of habits. Begin to combine your spontaneity with knowledge, moderation and self control. You need never go to extremes – begin to develop a true and proper response to all situations “as they arise”. Separation develops from your inability to take life as it comes – moment by moment – combining the elements of your personality, so that they work in harmony with the outer world and flow together naturally. You withdrew from the world to find your “inner” Self. The time has come for you to return to the normal activities of life and involvement with the outer world. The energy of your unconscious, which was once displayed as the “sexuality” of your undeveloped personality – has been transformed and channeled through your awareness to become spirituality. Your “strength” has become energy and the process will be complete once the two combine. Allow yourself to experience the death of your “old” patterns, for they do not reflect the truth and joy of life. You do not need to preform miracles to KNOW your connection with the universe – you need only be yourself. Become the master of your fate – learn correct action – doing the correct thing in whatever situation arises, dealing with life as it comes – not according to your old routines or habits of defense. Communicate the abundance of your feelings in compassionate and nurturing ways and this balanced blend of activities and feelings – once achieved, will produce the sense of harmony and peace that you seek. Here is the fourteenth stop on your journey, where you begin to appreciate the lessons of the higher emotions. This is a mature emotional constitution, where consideration for self and others strive to balance. This is Stage Four and the effect of higher mind on the Emotional Plane guides us to thoughtful behavior. Recognition and practice of both give and take in equal proportion, even as the opening of the heart chakra has elevated the emotions to the higher level wherein compassion transforms us into willing givers moving happily toward universal love. Temperance is the exercise of emotional balance horizontally in the earth plane, to generate movement vertically from below to above. Here is authentic expression and a higher understanding of your passionate nature, which must grow even as you become more compassionate. In the first position: Here is ecumenical awareness personified. Everything means everything. Nothing means nothing. Everything makes sense, and nothing makes sense. “Avec de la patience on arrive a tout.” (With patience one arrives at everything.) A natural born diplomat. In the second position: You have been so efficient in how you accomplish your tasks in the physical arena that you are rested and ready. You avoid the extremes in work, diet, and exercise. 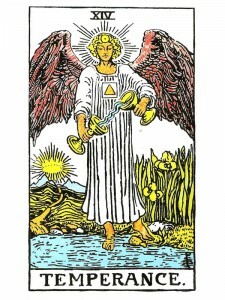 In the third position: Ask for Temperance for that is the archetype needed at this time. Let it descend from this, the Spiritual Plane down through the Mental, Emotional, and Physical Planes, to heal where imbalance has left its mark. In the fourth position: This passion for emotional balance and harmony will insist on equality in relationships, as close to so/so as it can get. This equality does not infer role swapping or the like, just that energy of participation be equal regarding both energy in and energy out from each partner (or from all participants in groups). In the fifth position: You are planning how to correct an imbalance in the Emotional Plane. You may want to shift the weight from one area to another. The issues may already be on the table for discussion. In the sixth position: This is Temperance in its home base and the effect will be especially strong. The reading may center to a great degree around this card here. in the near future you will be delicately balancing give and take. Remember that proper giving/taking does not require sacrifice from either party. In the seventh position: Here may be a concern with the heart content of information, of words and ideas. Be as objective and fair as possible and still satisfy your goals. In the eighth position: You are having to temper your actions, saying and doing less (or more as the case may demand if you have been too passive). Reconciliation may be underway. Redistribution of material resources with high emotional content. In the ninth position: This heart understands that it will only get stronger if it can equalize the flow of energy in and energy out. It is in the process of redistributing energy at this very moment to achieve that balance. There may be a shift in the amount of normal giving, or taking, the desire to cooperate, to compromise. In the tenth position: You will be washed with the emotional balm you need, suggesting you need the efficiency of all your energy directed toward a worthwhile endeavor of great benefit to you. Hello- I am new to tarot and my spirit continually draws me to your page for explanations. Can you break down this statement for me even further because I am not sure I understand. “The energy of your unconscious, which was once displayed as the “sexuality” of your undeveloped personality – has been transformed and channeled through your awareness to become spirituality. Diana, I truly appreciate your interpretations, if it is you doing this. I also read cards and must state you do an excellent job. Thank you for your kind statements – curious, why do I need “popular” when the ones who need the messages get them? knows what they are talking about on the internet. You actually understand how to bring a problem to light and make it important.